Tyserninja in game: 2,860 Who? Important notice! Pokemon Tyserninja is a fictional character of humans. 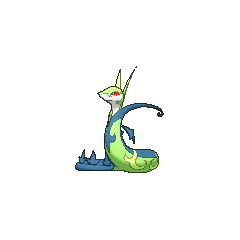 Serperior (Japanese: ???—? 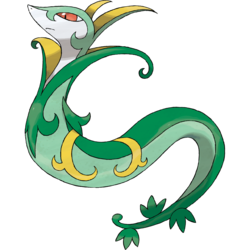 Jalorda) is a Grass-type Pokémon introduced in Generation V.
Serperior is a primarily pale green, serpentine Pokémon. Its face and throat are white, while its back is dark green. Curled, mint-colored patterns extend into the white portion of its face, and it has narrow red eyes. In the lower jaw, two fangs are visible when its mouth is open. There are two pointed yellow extensions on the back of its head. Coiled, dark green extensions spread out from the sides of its lower neck, forming a curving pattern lower down the body. 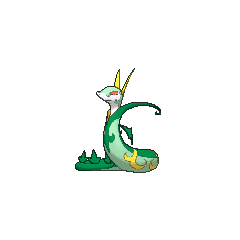 It has curved yellow markings around its middle and several palmate leaves on its tail. 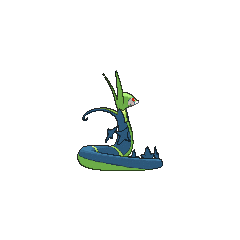 Serperior will only attack with full force against opponents that are unfazed by its piercing glare. It is capable of amplifying solar energy with its body. 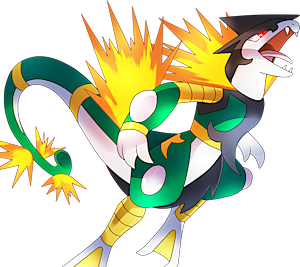 Trip's Servine was revealed to have evolved into a Serperior in Jostling for the Junior Cup!. A Serperior first appeared in White—Victini and Zekrom and Black—Victini and Reshiram, under the ownership of Mako. It battled and lost to Ash's Pikachu in a tournament held in Eindoak Town. A Serperior appeared in New Places... Familiar Faces! as a part of one of Nanette's fantasies. White owns a Serperior named Amanda. Serperior is based on multiple species of snakes and limbless lizards, such as Oxybelis fulgidus, Ahaetulla nasuta, and Ahaetulla prasina (species of vine snakes), as well as the emerald tree boa, royal python, and possibly Burton's legless lizard. The shape of its head and the extensions on its collar may be based on the bird of paradise or false bird of paradise flowers, a cobra's hood, or a snake's shed skin. Its body markings resemble the acanthus leaf motifs popularized during the Renaissance. Jalorda is derived from ? ja (snake) and lord. Korean ??? Syaroda Possibly from the English word sharp (?? ), shah (? ), or a corruption of ?/? sa, and a corruption of the English word lord (??). Mandarin Chinese ??? Junzhushé Literally "Monarch snake".